Can the fate of a single building change the dynamics of a neighborhood? It feels that way for at least one Seattle community. Like an island nestled in a neighborhood lined with historic houses and trees, a building sits equally old and brimming with history. It has been the home to many school children over the decades, filling the neighborhood with sounds of laughter and faces of many colors. With summer rapidly approaching the doors to the Columbia School building will be closing. But unlike other schools, the doors will close indefinitely, its fate undecided. In this rough economy closures have become an epidemic. Like wild fire, they burn through cities and neighborhoods, leaving empty spaces that may have once been vibrant. Schools are no exception and though our reaction has dulled the sting for some has not. “It's an issue going on in about every urban city,” explains developer Scott Barkan of Beacon Development Group. In the last 7 years Seattle Schools has closed and inventoried 10 school buildings. From Magnolia Elementary closed in 2002 to Fairmount Park in West Seattle, these buildings sit unoccupied as remnants of the past seemingly forgotten. The Columbia School building had been the home to the alternative program Orca since 1989, but in a 2005 news release Seattle Schools recommended the building's eventual closure. In 2005 the building, designed in the '20s mission style, was 83 years old and had been showing its age with a faulty roof, a below code seismic rating, and in need of a general modernization to meet a school's needs. As a result it received a very low building rating and renovating it would be extremely expensive. Having to tighten their belts, the district decided to move Orca to Whitworth, combining the two to become a K-8 school. Combining the two programs and indefinitely closing the Columbia building would save the district over $350,000 annually. “This building is at the end of its design lifespan. The Seattle Public Schools design lifespan is 50 years...” as quoted in the comments section of the document. So that following summer the doors of the Columbia building were locked and not just for the season. New life was breathed into the building when the it was selected as an interim site in 2007 for the New School while a modern building was being constructed for the program in South Shore. The Columbia building would house the program until 2009, but remained “slated for eventual closure.” Having only received minor upgrades the historical building was still ailing from age. Additionally, the building at capacity and with three portables was holding around 300 students. The typical model for an elementary school is around 400 students. “From talking to parents and kids...it's just not up to par,” states the youthful librarian Gabriel Rapier of the Columbia City branch, between lecturing kids about the importance of returning books on time. Anxiety is flourishing with concern amongst the community in anticipation of the closure. They are nervous because of what happened the first time the building stood vacant. “There's been problems in the past when the school is vacant...crime sky rockets, bad things go on in the parking lot,” explains Dara Ayres, executive director of Bike Works, a non-profit organization two blocks down the street from the school. Ayres stands in the kitchen of Bike Works remembering out loud the shady characters and behavior that took place after the Orca school's departure, expressing concern that the organization and neighbors felt about the vacancy. Sitting on over 3 acres, surrounded by homes, and two blocks from Columbia City's landmark district the real possibility of crime and vandalism on this island of land has made most members of the community nervous, not just the immediate neighbors. Besides safety, the community does not want to see this historic building fall into disrepair becoming an enormous eye sore in an otherwise charming neighborhood. The building is also less than a mile from the nearly completed Columbia City light rail station, making Edmonds Street and South Ferdinand Street (where the building stands) the two main thoroughfares to the downtown area. If visitors choose the latter, passing the lot would be inevitable. Columbia City residents are worried about what visitors might see when passing the block of land if left vacant. Generally speaking, Barkan explains the inevitable possibilities of vacant buildings. As relayed by Barkan and Ayres, immediate neighbors are generally concerned about it just being vacant but some community entities are interested in possibly leasing or buying the building. The fact that the building was inventoried paired with the district's silence regarding its future plans has aroused interest and the idea that the building might be attainable. This is not far fetched considering the pending sale of the University Heights building which has been converted into a community center. “Historically the district did not sell property but they need the money,” excitedly theorizes Pat Chemnick of Southeast Effective Development (SEED) on the phone. Being in the center of the neighborhood, it is an enticing piece of land with real possibilities. The fate of the property could make a real impact on the dynamic of the neighborhood that is facing ongoing growth while simultaneously fighting gentrification. The majority of interest has been expressed by non-profit organizations seeking to make a difference and viewing the property as a prime location to do so. “The people at the meeting loved the idea of Bike Works or multiple non-profit organizations operating on the ground floor for mixed use. They got wildly excited about that. But the school district wasn't interested in selling and they were really sort of dodgy about they wanted to do with it (Columbia school building),” remembers Ayres, explaining the interest that was generated the first time the school went vacant. Bike Works has not readily expressed interest in the building this time around, having been denied the first time. “Arts in motion is another example. Zion Prep is interested in the space as well,” says Barkan as he rattles off endless ideas for the building if its spaces were up for grabs. Attachments become strong to buildings like this, buildings preceding their neighbors, epicenters of communities, a place of learning and cultivation...an old friend. Barkan explains that the property can be viewed as sort of owned in theory by a community because of this, a community asset. “It can be one of those tools for fighting gentrification,” he says. A tool in a limited toolbox. As these aspirations germinate, the community has been struggling for the last four years to communicate with the school district. Initiating a conversation has been generally unsuccessful and frustrating for the community. “The real story is getting any information from the school district. It is irresponsible to ignore the dynamics of a community,” angrily exclaims Columbia City resident Rob Mohn on the phone. Realizing the need to band together, Barkan, also a resident of Columbia City, helped found the group Friends of the Columbia School. The group's conception came to be about four years ago, right around the time it was made public that the building would eventually be closed. Discussions between neighbors and community members evolved into the group which is focused on organizing a cohesive and diverse voice amongst the community regarding the building. Their goal was to be prepared if the school came to them so they could explore questions surrounding financing the building, the historical aspect, and how these characteristics play into the development of the building and/or the property. “We were not interested in taking ownership, proposing ideas to rent or buy the building,” says Barkan. The problem: the school district has not initiated or provided any tangible information to the group or the community. This has made organizing the group extremely difficult. “It's never been clear how we can best organize neighbors and the community to interact with the city and school district if the city and school district didn't know exactly what they wanted to do with the building,” states Barkan. Aspirations aside, he understands that the building is not actually owned by the community and that the district has different priorities and fiscal responsibilities that may override community interests, but would like to work together nonetheless. Should the community be a part of the decision process? It is a question that many communities are grappling with. Barkan tried to contact Ron English, the Deputy General Counsel who oversees facilities, real estate and purchasing for the district, two weeks ago and never heard back. “We've been contacted many times. I tend not to pay attention and I tell them I'll put them on the mailing list,” says English casually. Deciding what to do with property owned by the school district is a tricky business. They have to examine kindergarten registration projections, changing neighborhoods, new transportation developments, and ever changing budgets. The result has been a process under constant revision with little in the way of concrete plans. New developments can result in sporadic plans that are be made at the drop of a hat. “It's a brush off because I don't want to say 'no,' but I can only do it on our time table,” says English explaining putting interested parties on the mailing list. English is interested in the building for some of the same reasons as the community. The new light rail station is one of the those reasons. But as plans change, he does not know for sure what the district intends to do with the property. “It's an interesting building. It would have a lot of potential if we actually left it vacant for several years and then tried to do something with it,” ponders English, but not committing to anything. He could have at least told them that. Local, seasonal, organic. The struggle over which of these characteristics regarding food is the most beneficial to person and environment has been the topic of many discussions over the last five or so years. First the environmental authorities commanded us to eat organic and places like Whole Foods found their conception, offering high priced organic fruits and vegetables sold underneath posters of hard working farmers. Farmers that in fantasy land appeared local. But consumers soon found out that some of their virtuous organic produce could be traveling from all across the continent to land in their local grocery store. This did not seem right. Eating seasonally and locally has environmental benefits as well as economic benefits. One of the best places to practice this habit is at your local farmer's market. My personal favorite happens to be the Columbia City Farmer's Market. Founded in 1998, the market becomes the bustling epicenter of Columbia City every Wednesday from 3-7 pm. Sprawled out in a parking lot adjacent to the Columbia Park on Rainier Avenue South, it is the perfect location for an open air market. On a sunny afternoon, the park is full of families, singles, friends and the like, lounging on the green grass with their tote bags full of fresh produce from the market. It is a meeting space, a community event that happens weekly. “It reminds me of my home country Vietnam, where people are everywhere and the food is fresh,” explained Columbia City resident Katie Ngo as she rounded up her rambunctious sons. As I roam through the market, I pass a small tent where two women are singing folk songs to a small audience of adoring children. The market often has events for children, with their most famous being the Zucchini 500, where children build mini derby cars out of zucchinis and then race them. It's hilarious. I stop at Alm Hill Farms booth, examining their produce. Bright orange carrots, fuchsia stained radishes, and sprightly greens proudly crowd the table. “Every week we have more stuff coming out of the ground and we offer the only organic asparagus in Western Washington,” says Anne Smith, who is managing the booth. Upon Smith's recommendation, I bought a bunch of spicy greens. I have no idea what I am going to do with the greens but that's half the fun. The farmer's market is a cornucopia of local and mysterious produce. For a cook, like myself, buying produce you have never heard of keeps the creative culinary juices alive and well. Local Sylvain Berthe laughs, and says that he buys whatever doesn't grow in his back yard. If you're not into cooking, then you can sample! Most booths attempt to lure customers in with tidbits of what they're offering. I had small squares of creamy goat cheese, a hunk of baguette, and a piece of a cayenne chocolate truffle from Trevani Truffles. “I've done the last two falls because the farmers leave and make room for me. It's a farmer's market so they have priority,” explains owner and truffle maker Anne Boyington as she rummages through her containers to find me a sample. Thea Preuss of the Neighborhood Farmer's Market Alliance explains that “it's been shown that farmer's do better at food only farmer's markets,” and that's their priority. Local chef, Julie Andres of La Medusa in Columbia City, takes advantage of the array of local produce by shopping for ingredients every Wednesday that inspire the restaurant's Market Menu. For $25 customers can enjoy local produce at its prime prepared with Sicilian influences. For at least this season Columbia City Farmer's Market will remain in its current location but the property has been bought by a developer. They are currently in search of a new location in Columbia City and come Spring 2010, I'm sure that it won't be hard to find their new residence. Sunchokes or Jerusalem artichokes, are the tuber of a sunflower. They are starchy like a potato and have hint of artichoke flavor. They're ugly but delicious! Melt 1 tablespoon butter with olive oil in large nonstick skillet over medium-high heat. Add Jerusalem artichokes and half of sage. Sprinkle with salt and pepper. Sauté until brown and just beginning to soften, turning frequently, about 10 minutes. Using slotted spoon, transfer Jerusalem artichokes to shallow serving bowl. Squeeze lemon juice of half a lemon over cooked Jerusalem artichokes. Combine remaining lemon juice, white wine vinegar, and shallot in a bowl. Whisk in remaining olive oil. Season to taste with salt and freshly ground pepper. Toss pan-fried Jerusalem artichokes, spicy greens, and Parmesan shavings together and drizzle with lemon vinaigrette. Enjoy! Operating out of a vintage bright yellow house with a sign on the front in large black and red letters, it's hard to miss Bike Works when roaming around Columbia City. If you don't know about Bike Works, on the surface it can seem like they merely sell used and recycled bikes. Cool enough, right? But it's the profit they make from selling bikes to the public that funds the beating heart of Bike Works. Founded in 1996, Bike Works is Seattle's only non for profit community bike shop, and they are primarily focused on supporting youth programs. Their most popular program is their 8-week Earn a Bike program where youths, ranging from ages 9-17, are given a used bike and told to strip it. “They get really excited about demolishing a bike,” says board president, Bill Lippe, who is a retired brain researcher. Every once and a while the door to the classroom opens and bursts of laughing and the sounds of clanking tools erupt from the room. Over the 8 weeks, the students learn how to completely overhaul a bike and assemble it back together. In order to earn their re-assembled bike, along with a brand new helmet and lock, they must accumulate 18 hours of community repair time in the shop. “These are the tools to accomplish youth development and empowerment,” says Lippe as he shows me Polaroids of smiling kids who have graduated from the program. "This camp changed me by allowing me to know what is possible for me!" says Travis, 11, as quoted in Bike Works annual report. Once the youths have gone through the program they're welcome to come in any time during drop-in hours and work in the shop repairing their bikes or others. Lippe tells me that one kid built eight bikes for his friends and family just during drop-in hours. Last year 276 youth served in one of their many programs and nearly 2,400 hours of community service were logged by youth. Stepping into Bike Works can be a little daunting. There are bikes everywhere in the tiny shop and house: on the ceiling, in the back of the house, stuffed in the attic and one cannot escape the strong odor of rubber in the air. Smells like work. As customers move in, we all shuffle around like clustering into an already brimming elevator. Space is not wasted here and neither are any components of a bike. “Our goal is to keep as much as we can out of the landfills,” explains Lippe. Bicycles and parts may find new life in the store to be sold, donated to Seattle based Alchemy Goods, where they make messenger bags out of recycled rubber, or donated to Ghana to support the Village Bicycle Project. 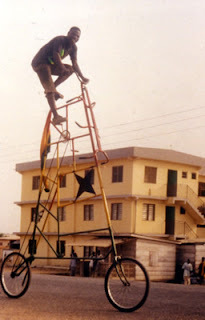 Last year over 1,400 bikes were sent to Ghana. I'm impressed. The last time I owned a bike it probably had a banana seat and pink streamers on the handle bars, yet I find myself falling in love with this little bike shop doing big things. Stepping into the kitchen with Lippe, I meet Dara Ayers, the executive director of Bike Works. “I'm not normally in the kitchen cooking,” she jokes as she stirs pasta for the strategic meeting dinner later that night. Trying not to be distracted by the delicious smells of pesto, I ask them how Columbia City plays a part in their operation. “What's happening, Columbia City's really grown, it's gentrified, property values are going up, it's going to be changing substantially in the future. That's why we're involved in the strategic planning given that these changes are going to be occurring—ya know what's our future? What do we have to do,” explains Lippe. As the neighborhood changes so do its needs and Bikes Works is motivated to serve underprivileged youth. Lippe explains that families with little resources are moved south so they have had to expand their outreach programs and are even considering changing locations. “The majority of youth come from this general south end Seattle and the focus of our outreach is in this area,” reiterates Ayers. As I help them set up chairs and move tables for the strategic planning meeting, I wonder how this would impact Columbia City if this little organization with a big heart would leave the neighborhood. But for now, it's the place where many kids find themselves after school and why you might see some kids riding around Columbia City with pride on their faces and on bikes they built. Many years ago my brother got a job cooking at a small French and Mexican fusion restaurant in a small up-and-coming neighborhood. The restaurant received rave reviews from the Seattle Times but eventually went out of business because apparently the neighborhood wasn't up-and-coming quite fast enough. This Seattle neighborhood was Columbia City. The first time I drove to Columbia City, directions placed carefully in the passenger's seat, I kept getting the anxious feeling of “uh...am I going the right way?” Having heard rumblings about the Seattle neighborhood tucked away like a secret in the Rainier Valley, I wondered if the rumblings were true as I drove past run-down store fronts that peppered Rainier Avenue on my way to my desired destination. 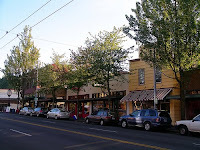 Stopping at the intersection of Rainier Avenue and Alaska Street I could see the surroundings gradually changing. To my right is the sprawling green grass of Columbia Park and adjacent is the historic Columbia branch of the Seattle Public Libraries built in 1909, standing alone like a beacon. Driving through the downtown shopping area, as charming as it was, I was possessed to continue driving...I wanted to see more than the storefronts that could only share so much. I wanted to see the houses that were homes to Columbia City's residents. Parking my car near the New School at Columbia and stepping out I immediately smelled barbecue, this was my kind of neighborhood! Recess in full swing, I walked past the chaotic school yard where I could see children of an array of ethnicities playing rambunctiously. I passed two suburban looking moms, strollers in tow, while two sketchy guys walked on the opposite side of the street. Turning the corner onto Rainier Avenue I saw the sign for the Columbia City Bakery. Opened in 2005, I had never been to the actual bakery before but had shared a cheese plate at a pub with a friend and I remember a baguette we could not get enough of; “I'm sorry, but can we get more bread, it's delicious,” we pleaded to our server. We later discovered it was from this very bakery in this mysterious neighborhood. While eating my chocolate chip cookie and sipping rubios tea, I noticed three women in the back baking, two clad in tattoos and bandannas, and the other wearing a hat. I think they were making rugelach. I watched grandmother's bring their grandchildren to get cupcakes and hot cocoa. They supervised, while the children bit into giant chocolate cupcakes topped with even larger strawberries, the kids licking their fingers in between bites. This seemed to be the after school hot spot for late afternoon treats. like the neighborhood she used to live in in L.A. where “poor artists and Mexican families” used to live before the condos took over. She's moving to Columbia City in June and I can understand her intrigue with this diverse neighborhood that manages to feel like a community despite its close proximity to downtown. I'm looking forward to exploring its nooks and crannies, as well as the people that give it its vibrancy. Hi. I'm Jennifer! Here are my passions...cooking and writing and this is me exercising them. I hope you enjoy both!